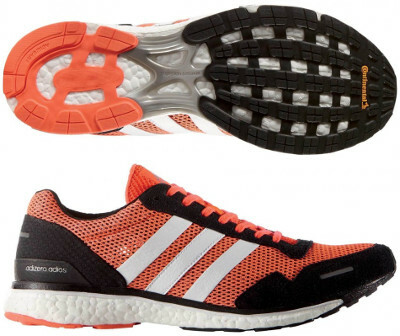 Adidas Adizero Adios Boost 3 are neutral racing running shoes. The Adidas Adizero Adios Boost 3 is the 2016 update for the most popular racing shoes from german brand. Around 10% lighter than its bigger sibling Boston Boost 5 and with responsive Boost™ cushioning, it has been designed for neutral runners to beat best times in distances from 5k to marathon. One year and a half after its predecessor Adios Boost 2 hit the market, it is time for an upgrade. Major change takes place in outsole where Zonemotion design in the forefoot has been replaced with grid pattern plenty of Continental™ rubber for more secure toe off and better grip even on wet surfaces. Torsion® System features natural integrity in the midfoot for good stability decoupling forefoot from rearfoot, where extra durable AdiWear carbon rubber is used in areas exposed to intense wear. Upper in Adizero Adios Boost 3 keeps Coolever® mesh which features soft feel and great breathability while reflective elements have been migrated from multiple spots to simple lines. As expected, midsole is completely made of innovative Boost™ foam for great blend of cushioning and responsiveness.